We invite you to explore India - the Land with infinite beauty ! Whether you soar high into Himalayas or peer under the ruins of the Ancient monuments dotting the landscape of India, you will cherish the experience long after your visit ! This India Travel Guide on Scuba diving in the Andaman is free from any commercial interest! This site is dedicated to promote India - the vast subcontinent, its glorious past, magnificent landscape and its infinite variety. Scuba diving is an excellent way to explore the entire life under the sea, especially the beautiful corals and marine life. If you are looking for a suitable scuba diving location to visit between December and April, Andaman is the right place to be in India. The depth of the sea is nearly 1000 meter, shallow in the north and east part. Lying in the Southern part of Bay of Bengal is Andaman or Andaman and Nicobar Islands, volcanic islands surrounded by deep, undisturbed blue green turquoise waters. Regarded as a world-class destination to discover the under-water treasures of marine life, the site is also home to the largest continuous area of reefs in South Asia. Adding to the beauty is the under water cave shells. The combination, the shapes and colors of corals is stunning. Fringing type reefs is another specialty of Andaman. Reef flat, reef crest and reef slope, all the distinct fringing reefs adorn defined areas in the Sea. The island is equally rich in coral diversity with as many as 179 species belonging to 61 genus which are found here. Coral reefs provide habitat for fish. The rich coral reefs in Andaman supports existence of endangered turtles like leather back turtle, green sea turtle, hawksbill turtle and olive riddle turtle, water monitor lizard, salt-water crocodiles, reticulate python. A scuba diving expedition in Andaman promises a close-encounter with these colorful and stunning aquatic lives thus making it an experience of a lifetime. Andaman cluster of islands is located in the eponymous Andaman sea, on the periphery of Bay of Bengal, a little below the Mouths of the Irrawaddy off the coast of Myanmar ( earlier called as Burma) consisting of north, middle, south and the little Andamans. There are many approved scuba diving centers in Andaman. Qualified scuba dive instructors guide enthusiastic tourists and ensure a safe and surreal experience. Stay close to the instructors and adhere to regulations and limits. There are select scuba dive locations reserved for the novice and the experienced scuba divers. Discovery of new scuba diving sites continue. Cinque Island: Clear emerald water, visibility up to 80 feet, vast variety of marine life like black coral, sure sightings of sharks. North Point: Located in Cinque Island, this point is best to view abundant marine life. Southern reef: A popular dive site to view hard and soft corals. Bala Reef: Best site to view coral with vibrant colors. Havelock Island: The largest of the islands, the land is a favorite spot to watch sunrise and sunset. The water is an appropriate site for adventure seekers as there are many unexplored dive sites rich in underwater marine life. The Wall: Site of a submerged rock, home to soft corals and highly populated with variety of fish species of different sizes and colors. Barracuda city: Variety of fish and some turtles, both soft and hard corals. Corruption Rock: The craggy landscape made up of big underwater boulders the gullies, channels, ridges and canyons, this site qualifies as the best underwater site for photography. While scuba diving, a close encounter with dolphins, tuna and reef sharks is common. Rutland Island: A site favored for training open water divers, the shallow water is home to many smaller fish and coral besides the remains of a ship wreck. Snake Island: Thickly populated with fish species like Trigger fish, grunts, rays and Goatfish. Mac Point: Hard corals are found here. Andamans seas thrive with 150 species of dugongs, a huge mammal weighing about 400 kg and the length is about 3 m long. Spotting dugongs at Mac Point is common. Seduction Point: Suitable for experienced divers, there are many unexplored sites rich in underwater marine life. Many dive schools are close to seduction point. Lighthouse: Appropriate for all scuba diving levels, this site is best explored during the night time. 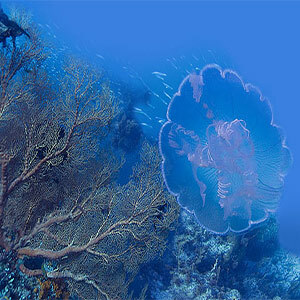 Pilot reef: Scuba dive at Pilot reef and discover the huge block of pristine hard corals. The site thrives with a variety of fish species like Napoleon Wrasse, Leopard Shark, turtles, sea snakes etc. Other diving islands: Fish Rock near Passage Island, Ghost reef, i-95, Mystery mountains, Duncan's wreck, Jacobs table, Guddo's garden and Jackson's bar are few other diving sites in Andaman which make for unusual diving.